This week I'm giving you the chance to win a Traditional Afternoon Tea Hamper! This delightful box of goodies includes an assortment of melt in the mouth All Butter Shortbread, Brandy Snaps, Whisky Cake and a tin of Black Ceylon Tea. Enjoy a cup of tea with this delicious range of cakes and biscuits as an afternoon treat or a mid morning pick up. This lovely hamper comes all wrapped up, making it the perfect gift for a loved one, or just a nice treat for yourself. Don't miss out, enter today for your chance to win this wonderful hamper and impress your loved ones next time they pop round for a cup of tea. This looks amazing, good luck everyone! This week, I'm giving you the chance to win this lovely Hotel Chocolat Hamper - you lucky folks! This carefully curated collection showcases some of Hotel Chocolat's best-loved recipes and contains favourites such as Milk Chocolate Puddles, Billionaire's Shortbread, Chocolate Brownies, a Mini Patisserie Collection, Salted Caramel Treats and more. This is the perfect gift for any chocolate lover, or for yourself if you fancy a bit of self indulgence this Autumn. Don't miss out, enter now for your chance to win these luxurious chocolate treats. Tell your friends and family about this fabulous competition as well. Who knows? They might share with you if they're feeling generous. There's nothing like Cadbury chocolate is there? This week in our competition you can get your mitts on a sharing Hamper, and it's crammed full of all your favourite chocolate - yum. 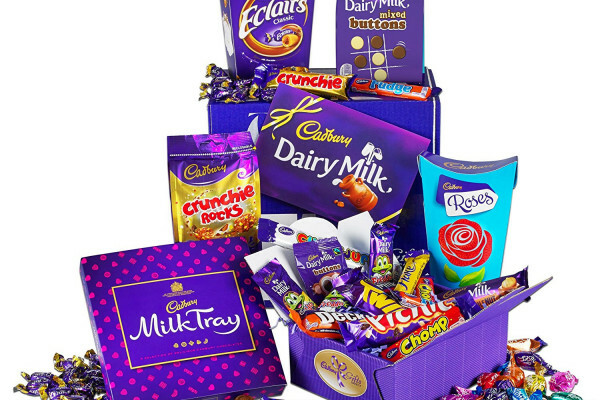 This wonderful hamper contains Milk Tray, Roses, Chocolate Eclairs, Buttons, Treasure Box and so much more! You won't be short of delicious treats to eat. It's a chance for you to meet with family and friends, settle in for a nice film and munch on some tasty Cadbury chocolate. Or, if you're feeling pretty naughty, you could keep the whole thing for yourself - that's fine too! Are you feeling lucky? Enter the easy form below for your chance to bag this brilliant prize. I have my fingers crossed for you! It may be hot outside, but right now you can win this super cool Zoku Slush and Shake Maker in this week's competition! This fabulous little gadget makes slushies and milkshakes in minutes. Fill it with all your favourite ingredients, mix the cup with the funky spoon and watch as the slush freezes before you eyes! This looks amazing. What's your favourite flavour? It's super easy to clean and store in your freezer, so it's always on hand when you fancy your favourite iced drink. Don't miss out folks, enter today for your chance to win this lovely prize and you could be sipping on your favourite slushies or milkshakes in no time. Be quick though, this competition won't last forever. Good luck! This week I'm giving you the chance to win this lovely Ice Cream Maker - what a perfect treat for Summer! Voted the most popular Ice Cream Maker by Which, this delightful machine makes delicious homemade ice cream, sorbet or frozen yoghurt in minutes. You can even add your own favourite treats during mixing via the extra-large ingredients funnel - chocolate chips anyone? The super fast-freezing insulated bowl with 1.5 litre capacity ensures enough ice cream for the whole family! So what are you waiting for? Enter today for your chance to win this fabulous prize. Don't miss out, there can only be one winner so enter now for your chance to win. Don't forget, sharing is caring so tell your friends and family and you'll all get to enjoy this lovely prize. Good luck! This week I'm giving you the chance to win a fabulous Blue Multifunctional Smoothie Maker! Get healthy just in time for Summer with this amazing prize. This versatile food processor can quickly chop, slice and shred your favourite fruit and vegetables to whip up a delicious and refreshing drink in minutes. It comes complete with a 700ml large jar and an extra cup perfect to take your favourite juices and smoothies on the go. It's so easy to use and clean so you can make some tasty smoothies and impress your friends and family all Summer long. What are you waiting for? Enter today for your chance to win this fantastic prize. Don't miss out, you could be our winner! This week you can win a Craft Beer & Snacks Hamper! Treat yourself or a loved one to lots of unique little treats - trust me, you won't be disappointed. This fabulous hamper box is bursting with 2 bottles of small brewery beers and 7 different bar snacks for you to feast on. These treats include traditional and unusual bar snacks to enjoy with beers including Traditional Pork Scratchings, Cajun Spiced Mixed nuts & Hand-cooked Crisps, plus baked flatbread thins, Pizza flavour bread stick snacks, fried crostini bites and dough rings cooked with wine. Yum! It also comes packed in an attractive gift box so it would make the perfect gift for a loved one! Enter today for your chance to win. This week I'm giving you the chance to win this fabulous Retro Popcorn Maker! This classic red and white popcorn maker lets you cook homemade delicious, fresh and healthy popcorn, perfect for a movie night at home! It's super simple to use and even comes with six, cinema style popcorn boxes so you and your friends can have tasty homemade popcorn in less than six minutes. Enter now for your chance to win this super duper popcorn prize! There can only be one winner and you've got to be in it to win it so don't miss out, it only takes minutes to enter and it could make you the hostess with the mostess when it comes to your next movie night. These look amazing. We Bake has 15 exclusive tea party hampers up for grabs. Just register with them to find out all about it. I've got a sweet treat for you all this week! You can win a Swizzels Retro Sweets Hamper - how exciting. You can win a fantastic assortment of retro sweet classics. It is beautifully presented and very unusual so will make a great gift for any occasion. Treat yourself or a loved one to an assortment of old school classic sweets that includes Love Hearts, Refreshers, Drumsticks, Fun Gums, Parma Violets, Double Dip, Double Ollies, Fizzers & Fruity Pops, the list goes on! If you fancy taking a trip down memory lane with this fancy sweet bundle, enter today for your chance to fill your boots with these classic sweets from Swizzels. Good luck folks. Save me a Drumstick if you win!